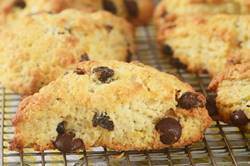 Chocolate Chip Scones make a very tasty breakfast treat. These scones also contain sweet dried red cherries which I think pairs nicely with the dark chocolate chips. One of my favorite ways to make scones is with buttermilk, instead of the more traditional cream (or milk). Buttermilk gives these Chocolate Chip Scones a light and spongy, almost bread-like, texture. The scones are baked in a fairly hot oven which gives them a nicely browned outer crust. If you can enjoy these scones the same day as they are made, preferably shortly after they come out of the oven. Chocolate Chip Scones can be made using regular chocolate chips or, if you like, you can cut up your favorite chocolate bar into uneven chunks. While the recipe calls for dried red cherries, you could use dried cranberries or there are many other dried fruits that could be added to the dough instead of dried cherries. Dried apricots, prunes, figs would be nice, or you could leave out the dried fruit completely. If you are not familiar with buttermilk it has a nice thick creamy texture with a rich tangy buttery taste that makes baked goods tender. Whereas in the past it was the liquid left over after churning butter it is now commercially made by adding a bacteria to whole, skim, or low fat milk. You can make your own buttermilk by adding 1 tablespoon of white distilled vinegar, cider vinegar, or lemon juice to 1 cup of milk. Let stand 5 to 10 minutes before using. Another option is to use dried buttermilk powder, which is conveniently sold in plastic bags or canisters. For more information on the history and making of Scones. Chocolate Chip Scones: Preheat oven to 400 degrees F (200 degrees C) and place rack in middle of oven. Line a baking sheet with parchment paper. In a large bowl, whisk together the flour, sugar, baking powder, baking soda and salt. Cut the butter into small pieces and blend into the flour mixture with a pastry blender or two knives. (The mixture should look like coarse crumbs.) Stir in the chocolate chunks (or chips) and dried cherries. In a small measuring cup whisk together the buttermilk and vanilla extract and then add to the flour mixture. Stir just until the dough comes together (add more buttermilk or flour as necessary). Do not over mix the dough. Transfer to a lightly floured surface and knead dough gently four or five times and then pat the dough into a circle that is about 7 inches (18 cm) round and about 11/2 inches (3.75 cm) thick. Cut this circle in half, then cut each half into 4 pie-shaped wedges (triangles). Place the scones on the baking sheet. Brush the tops of the scones with a little milk. Bake for about 15 to 20 minutes or until golden brown and a toothpick inserted in the middle comes out clean. Remove from oven and place on a wire rack to cool.